In June 1906, on the rooftop of Madison Square Garden, multi-millionaire heir Harry Kendall Thaw murdered renowned architect and philanderer Stanford White, claiming retaliation for the sexual assault of his wife by White, before marriage. Although, Thaw had suffered from mental illness since childhood, the defense refused the prosecution's offer of an insanity plea, to protect the family name. Instead the family's great wealth was used for legal maneuvering and publicity - including funding this fictionalized account (starring Thaw's wife, playing herself), that portrays Thaw as the heroic defender of woman's chastity. Although the film ends with Thaw's acquittal, the film was released before jury deliberation. In reality, the jury could not agree. Thaw was retried and pleaded temporary insanity. According to the Wikipedia article, "The film was denounced in the motion picture press and banned in several cities": quite an achievement for an art form still in infancy. 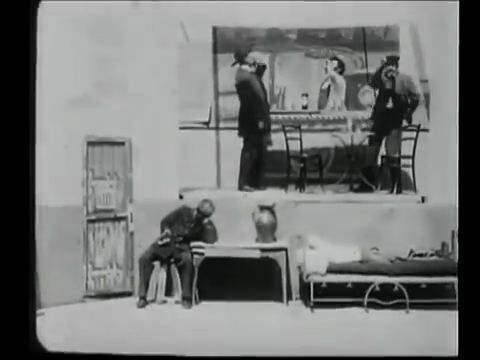 The film's prison scene recycles the flashback technique used in the 1901 Histoire d'un crime.